The central Oregon Coast is a beautiful community, but it has a big problem: Housing insecurity and homelessness affect many of our neighbors. 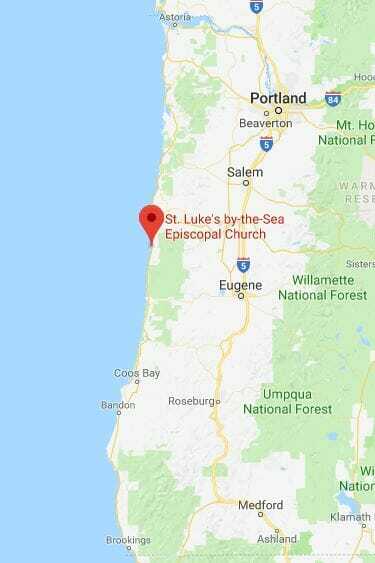 One of the ways that problem manifests for St. Luke by the Sea Episcopal Church, a congregation blessed with private wooded property on the Pacific Coast Highway, is that people often camp here without checking in or asking permission. The congregation at St. Luke’s has always felt a call to engage with our neighbors in a more effective way, and starting in 2018 we have a new path forward. It began with a simple offer: a friend of the church contacted Vicar Judith Jones+, saying that he was interested in building a Conestoga hut—and would the church be interested in having it on the property? A Conestoga hut is an enclosed, insulated, lockable structure, about 6’x15’. 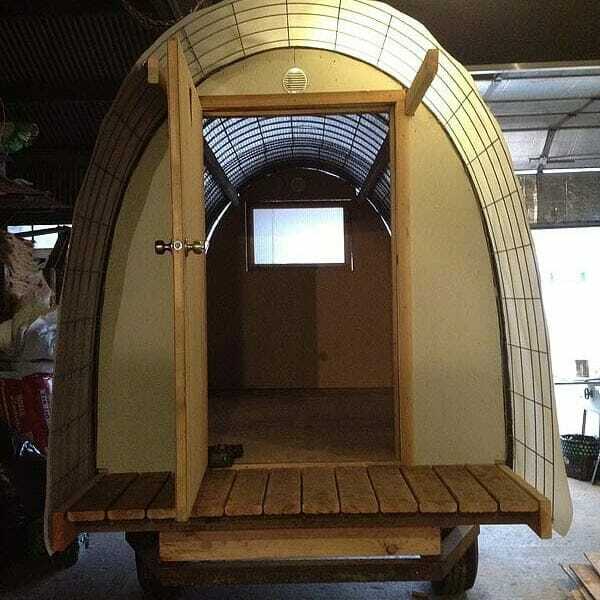 It contains a small bed, a light, a space heater, and a small amount of storage space. The idea of being able to offer transitional shelter in a consistent, safe way to our homeless neighbors seemed sensible—and here was a solution, offered as if from on high. But of course, things are never that simple. It was inappropriate to start a program like this without engaging the congregation in the decision. So the BAC formed an ad hoc committee to research the use of Conestoga huts on church properties. They took a field trip to see what the Episcopal Church of the Resurrection (Eugene) and the Episcopal Church of St. John the Divine (Springfield) had done. A local volunteer with experience working with women as they transition out of jail offered to be our liaison to help find potential residents, and to work with our vicar to obtain appropriate services for their care. As we did this preparatory work, we applied for and were awarded a grant from Church Divinity School of the Pacific to build a second hut. And just a few weeks after that first conversation, we wrote a proposal for a church vote. The BAC agreed that it was important to give the congregation time to learn about the project, and to ask questions and share their concerns. The final proposal was ambitious: we asked for approval to erect two Conestoga huts near an outdoor water source, to wire them for light and heat, and to rent a locking Port-a-Potty. 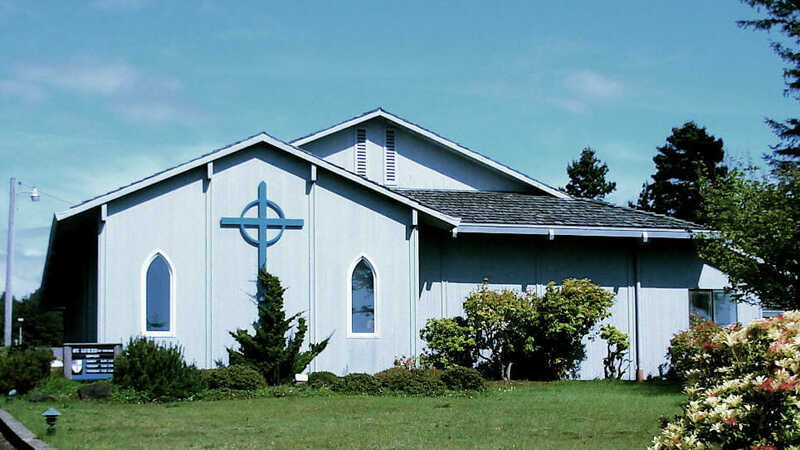 Integral in the proposal was a longer-term plan to write a diocesan grant to help upgrade the sewer system in a way that will allow us to build a permanent bathroom and shower facility—but that is for future planning. After several weeks of questions, answers, and prayerful consideration, the vote was held. We had agreed that at least 66% of the votes had to be in favor to move forward. We had over 75% in favor. Our next stop was to work with the city planning commission. Because homelessness is such a significant issue in Waldport, city planners are aware of both the benefits and potential hazards of approving a project like this. The deciding factor in our favor: this is not just transitional housing. It comes with services for therapy, job placement, and other support systems that will help our neighbors rebuild their lives and reintegrate into the community. We know that sharing our space with women who are transitioning out of jail will stretch and challenge us. Sometimes they will make decisions that we disagree with or do not understand. If they violate the terms of our covenant with them, we will have to intervene. We will be tempted to judge, and we will be tempted to feel superior. We are praying that God will help us to see our own failures and weaknesses and show us how to become a truly welcoming community. We are praying that God will open our minds and hearts to see the women who live in the Conestoga huts not as objects of charity, but as neighbors. We know, too, that even though we will be helping two women at a time, many other people in our area will still be without shelter. We hope that the relationships we build through the Conestoga hut project will help us to learn more about the causes of homelessness, the ways our own choices contribute to the problem, and the systemic changes that we need to work for. The theme of our 2018 Stewardship Campaign is, “Won’t You Be My Neighbor?” St. Luke by the Sea Episcopal Church will soon be ready to welcome two new neighbors to our community. We can’t wait!